Some cells in our body have elongated structures or microvilli at their surface. These microvilli have many functions that help the cell to survive, and some features that make them act like train tracks that shuttle substances along them. We recently captured a movie of nanoparticles hitching a ride on these cellular train tracks. Nanoparticles are able to do this because they are just about the right size to impersonate other cellular components. Additionally, they have some unique and powerful properties that larger particles made of the same components simply don’t have. For example, because of their tiny size nanoparticles have a very high surface area to volume ratio. Since most of the action occurs at the surface, having a lot of it makes nanoparticles highly reactive and responsive to their environment. This property makes nanoparticles quite desired in some applications but also requires us to be very careful to make sure these interactions don’t become harmful. For example, nanomaterials are now explored for shuttling drug molecules into specific cells or organs that are affected by disease, such as cancer. Their relatively large surfaces and their “stickiness” makes it possible to load nanoparticles with a relatively large number of drug molecules. At the same time, their small size allows them to penetrate tissues and cells and reach their target. Nanoparticles are in the same size range as these tiny sacs full of fluids, or vesicles, naturally found inside cells. 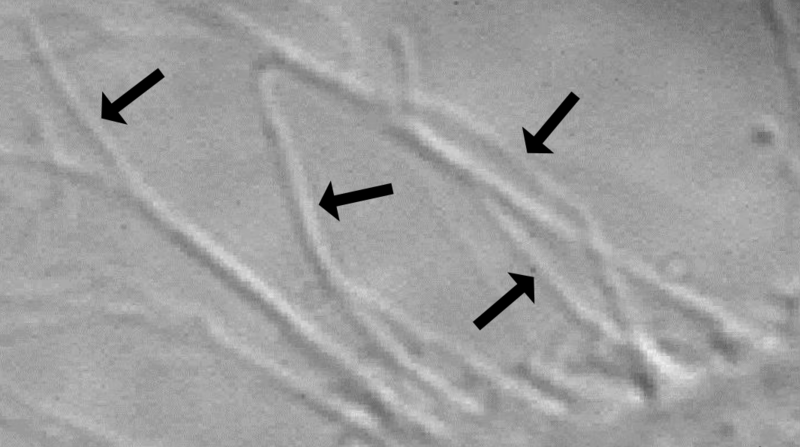 These vesicles shuttle proteins and other molecules to their destination inside the cell. Because nanoparticles can be mistaken for vesicles, they can easily assimilate to the cellular environment and even take advantage of the cellular machinery and the transport system of the vesicles. Here’s where we get to the movie of nanoparticles hitching a ride. In this movie you can see particles land on the elongated cellular structures, called microvilli, and start surfing along the microvilli toward the cell body. We used slightly larger particles so we could capture the motion using an instrument called a differential interference contrast microscope. The arrows highlight the particles that are surfing their way toward the cell body. The particles engage in surfing by taking advantage of the cellular machinery that constantly moves molecules toward the center of the cell. These particles could be designed to shuttle drug molecules to sick cells, but it is critical to ensure that they will not harm healthy cells that are also found in their path. We therefore carefully study the interactions of nanoparticles inside cells while closely monitoring the health of the cell. It turns out that the nanoparticles in the movie are not that harmful to the cells and might be a good vehicle for shuttling drugs, but more studies are required before we can reach a final conclusion.